This art piece was created to honor all of the self-sacrificing teachers who take on the incredibly important task and responsibility of guiding our children in their scholarly education. Even in ancient Judaism, the importance of education was clearly evident as exemplified by the age-old rabbinic precept that states “The world is poised on the breath of schoolchildren”. 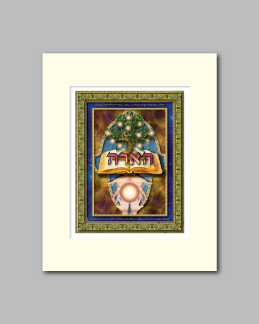 The outer border of this design features the following Hebrew proverb “A child is not a vessel to be filled, but a lamp to be lit”. 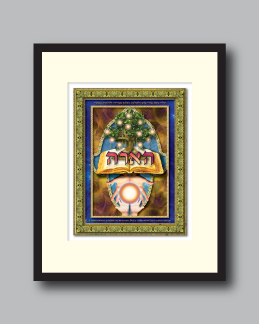 In golden letters, these words float upon a celestial blue background, representing the presence and guidance of Hashem, our Creator, in all things. The large “Chamsa” or “Hand of Miriam” frames the central image. The upper portion displays a twisted and gnarled primordial tree of knowledge from which glowing orbs of light delicately hang. 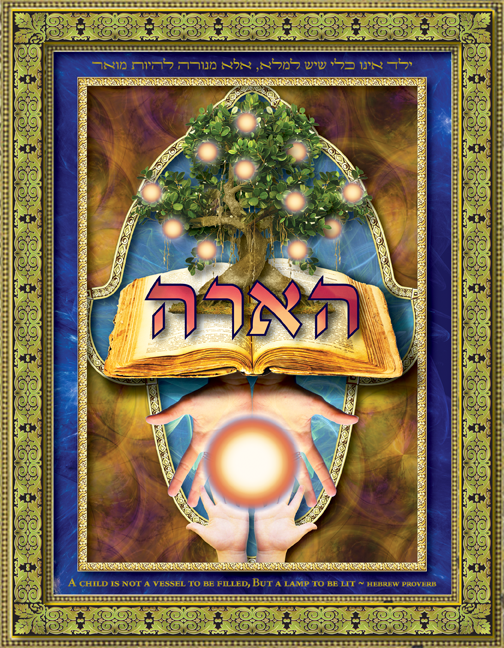 This tree is rooted to and rises up from an ancient book filled with all the wisdom of the universe. A pair of open, giving hands descends below the ageless manuscript. Within them is a larger glowing orb that is being transferred to and accepted by the smaller open pair of children’s hands that wait below. This orb, like fruit from the tree of knowledge, is the singular catalyst and divine spark of light that enlightens and illuminates the hearts and minds of all children.